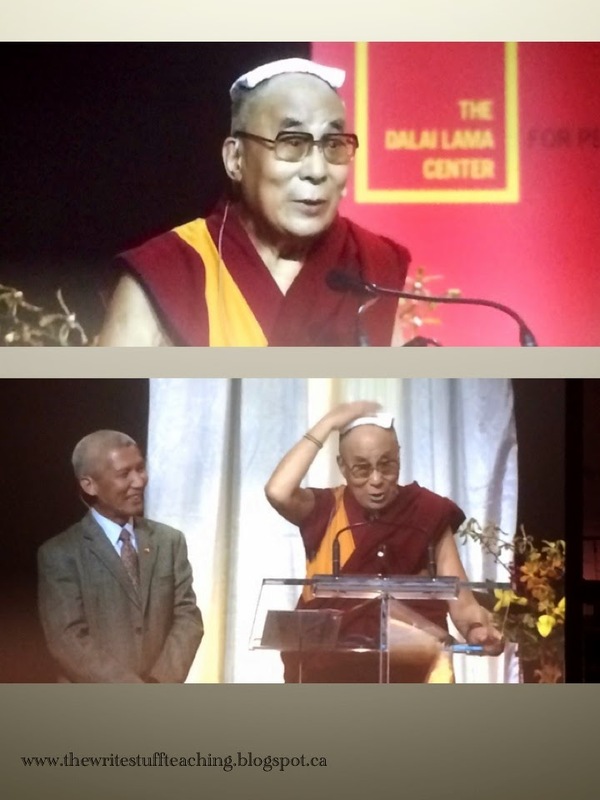 I wanted to share with you some of the highlights of the Dalai Lama visit that might resonate with you. I apologize ahead of time for the lousy pictures. The St. James choir was singing at the beginning. 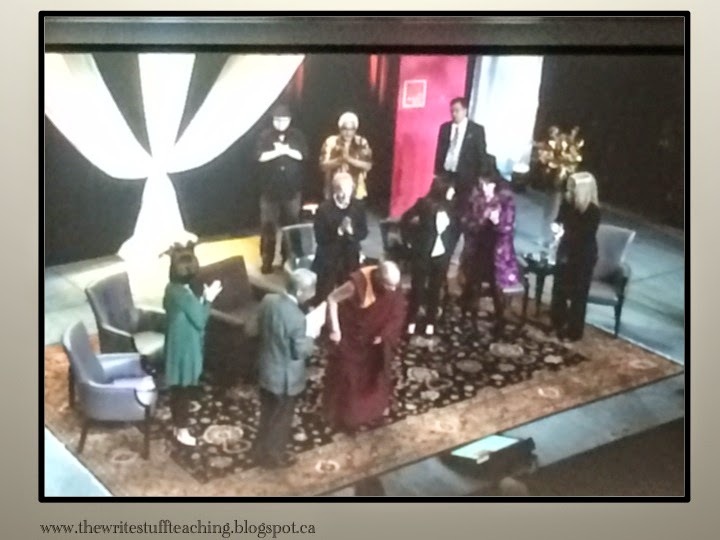 The Dalai Lama was so excited to hear them he went rushing onto the stage ahead of the introduction and call. In his address to the audience, the Dalai Lama talked about individual families and how they need to develop compassion. When individual families learn it, they share it with other families and friends, who in turn do the same. Having compassion for others leads to kindness and a feeling of well being for all. He talked about the lack of conviction of the individual person. The Dalai Lama said that if individuals were to build up their conviction for truth and kindness and compassion and really believe in it regardless of what others think, this compassion would spread. 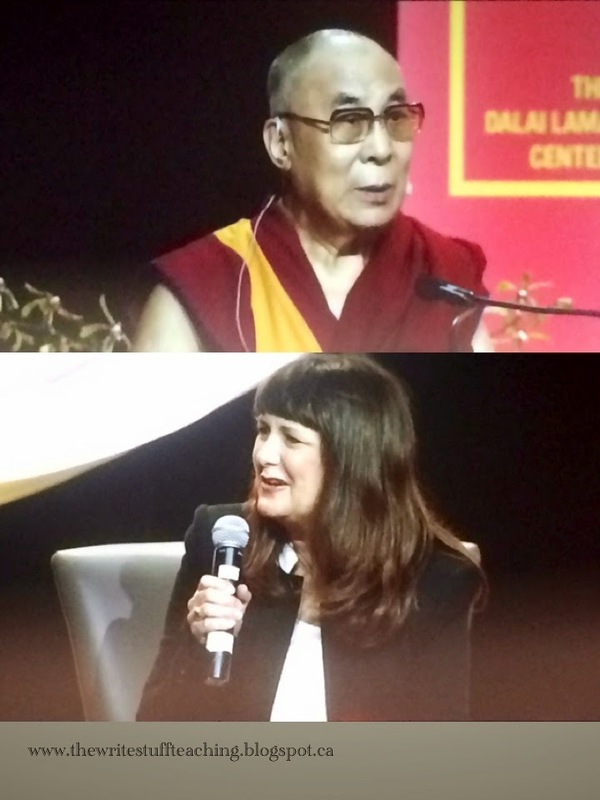 Dr. Kimberly Shonert-Reichl from UBC serves on the Board at the Dalai Lama Center and she was one of the panel members sharing the successes in BC and asking the Dalai Lama a question. Dr. Shonert-Reichl was my first instructor for my MEd. years ago and she really inspired me to learn more about social and emotional development. Dr. Shonert-Reichl talked about our province and how 37% of the province was learning about SEL in 2010-2011 and in 2013 – 90% of districts were incorporating it into their programs! She talked about Mindup and how teachers (such as myself) have been trained and are using the program with great results. 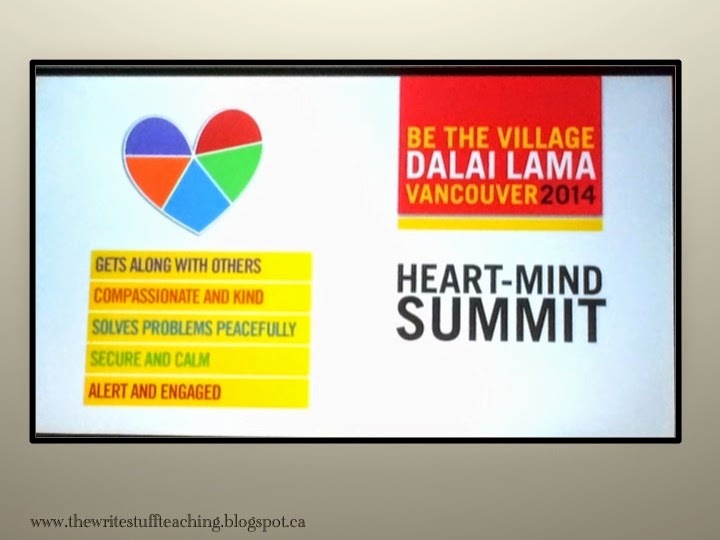 Then she asked the Dalai Lama – what’s next? The Dalai Lama answered her by saying that children need a map of their emotional mind. Which emotion are they feeling when they don’t feel happy? He explained that when you are in pain, you need to know the cause of the pain to find relief. It’s the same thing with your heart. Before children get very unhappy and/or angry, they need t try and identify what is making them feel that way. Self awareness. I spend much of the day teaching children about self awareness and how to put a name on their feelings. The Dalai Lama also spent a good deal of time laughing and joking around. He felt hot and decided that he should keep the cool cloth on his head! The Dalai Lama also discussed the role of the women in the development of compassion. He said that females need to take more responsibility in society because they are naturally good at compassion. When men spend time at home with their children, their compassion develops and so does the level of compassion that their children have. And finally, before he left. the Dalai Lama talked about the respect of oneness of human beings. We are all on this planet together. The more we think of each other as one and not 8 billion people, the more we will build compassion and kindness and have peace in the world. It all starts with educating our children. Educating their heart. I feel very blessed that I was able to take in this special event and I feel affirmed that what I am doing is on the right track to help our children, our future, practice kindness and compassion to one another. 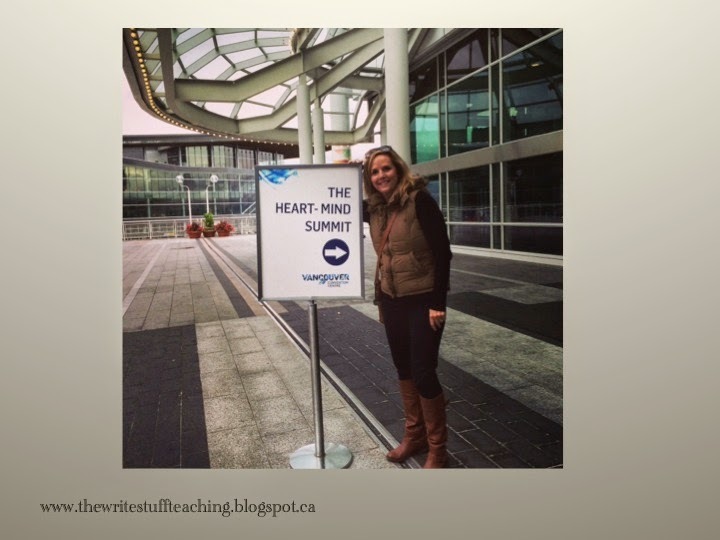 Have you ever seen the Dalai Lama or anyone else that you feel inspired your teaching? Wow, what an incredible experience! I absolutely love everything the Dalai Lama stands for, (including his use of humor!) I'll be the first one in line if he's ever in the Boston area! I'll bet you would be first in line Sally because I know you love this stuff as much as I do. 🙂 Thanks for visiting. Wow, I teach students on the autism spectrum. How do I find out more about the type of program in the article. Are you referring to the Mindup Program? You can get more info here: http://thehawnfoundation.org/mindup/ Hope that helps! Thank you for this, Shelley. Reading about your experience made me feel like I was there. That's really sweet of you to say. It was definitely a great experience.